However, don’t let these landscape mistakes get in the way of improving your curb appeal and making your home stand out in your neighborhood! Homeowners in Fork, Maryland, are probably worried about what to do with their landscape. Although spring is still a couple of months away, it’s not too soon to start thinking about what you will do with your yard this year. However, don’t let these mistakes get in the way of improving your curb appeal and making your home stand out in your neighborhood! It’s tempting to only plant evergreens in your yard. After all, what they do is in their name: they always stay green, no matter what time of year it is. While they can make a dreary January and February a bit brighter, you can choose other options to highlight your landscape design skills. Instead, look for perennials that will each bloom in a different time of year to give your landscape some different looks and feels as the seasons change. The next mistake many amateur landscapers in Fork make is allowing the hedges to grow too tall. If you have a homeowners association overseeing your neighborhood community, they may have a word or two for you. Make sure you prune the hedges, even if it is bitterly cold outside and you think they won’t keep growing. There’s not much point in boosting your curb appeal through landscape design if no one around you can see what your home looks like; plus, if you have trouble seeing through your windows, it could become an issue of safety. Fertilizing your lawn the right way is also important. Although you always want to do it properly, it’s entirely possible to over-fertilize it, or as the case may be, under-fertilize. Both of these techniques harm the grass and will stunt its growth. When it comes to landscapes and landscape design, you will want to add in some hardscape features. 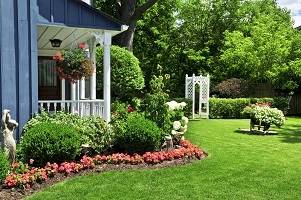 Doing so keeps your yard interesting and visually appealing. However, don’t get too carried away while you do this. This entry was posted on Friday, January 25th, 2019 at 12:29 pm. Both comments and pings are currently closed.